This summer, our team grabbed our bikes, put on our helmets, and rode down to the Marriott Marquis. An Event Apart, "the design conference for people who make websites," came to our home turf in San Diego this year. 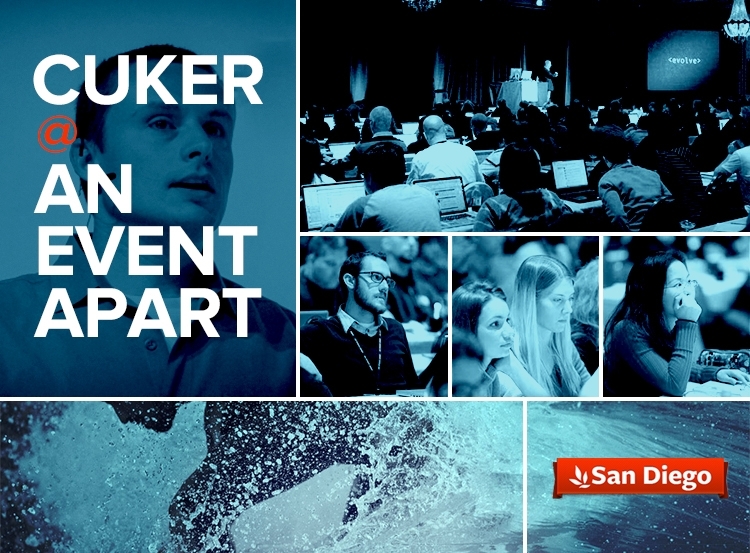 This two-day conference dove deep into what makes websites and experiences successful. There were tons of #nerdydesignerstuff takeaways from this conference and we’d like to take the time to share a few of our favorites. The Cuker crew embraced the importance some of the speakers placed on typography. Services like typekit, and the newly released HF&J cloud.typography are giving the web new life, allowing designers and developers to craft stories and experiences better than ever before. Josh Clark taught us that the days of a solitary input, like a mouse, are long gone, and that the user experience is "no longer about how your pixels look, but how they feel." The shift in consumption is strongly influencing how we are presenting to our customers and taking more time to understand their environment and mood. As the web grows (smaller), considerations must be made that we can no longer predict the user's environment. We have to consider the "mobile-only user" as well as “The Mobile Moment” defined as the moment when the mobile user base surpasses desktop usage. Because of this, it is more important than ever to prioritize your mobile strategy and ensure that your user experience is flawless across all digital platforms. Published on August 2, 2013 .